Terrified of Tests? Test Anxiety is one of the main reasons for poor test performance. Tips for handling test anxiety. Before the Test – what you must do before the test. Learn and practice proven multiple choice strategies for paragraph comprehension, English grammar, word problems and Basic Math! If you are preparing for this test, you probably want all the help you can get! 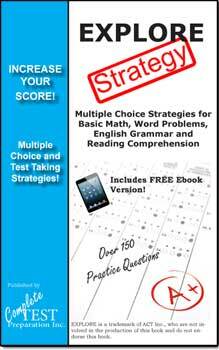 EXPLORE Test Strategy is your complete guide to answering multiple choice questions! Order PDF Download Version – $9.99 PDF Download Version of Printed Version. Download after purchase. No shipping! No Waiting!